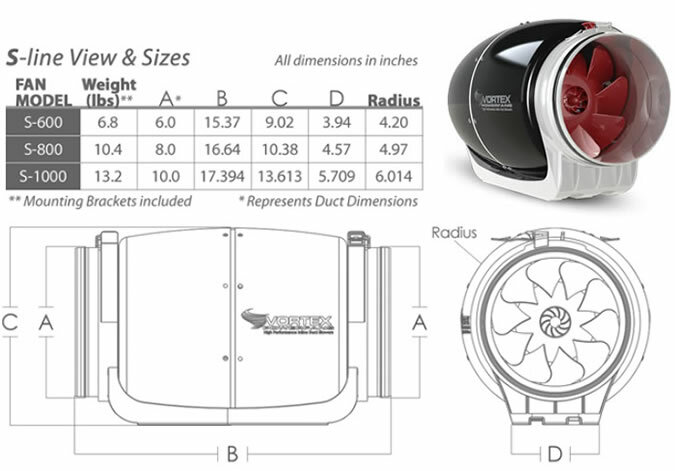 The Vortex Powerfan S-600 340 CFM 6" Inline Fan by Atmosphere is here. The quietest inline duct fan on the market, the vortex s-line is completely different from the competition, and specifically designed for the indoor grower. An extremely energy efficient ac brushless motor powers the patented mixed-flow dual impellers. Built with double insulated walls, noise is reduced to levels that were previously thought to be unattainable. All s-line models are assembled with high impact resistant polycarbonate casings, an integrated back draft damper and a mounting bracket designed for quick and easy installation.